New, TM 10-1333, 1940-45 Indian, 340 Military Chief, Overhaul Manual, 8.5"x11", 130 pages, 189 - excellent photos & illustrations are as clear as the originals. Mint condition. Many specifications & procedures are the same on all 1922-53 Chiefs. 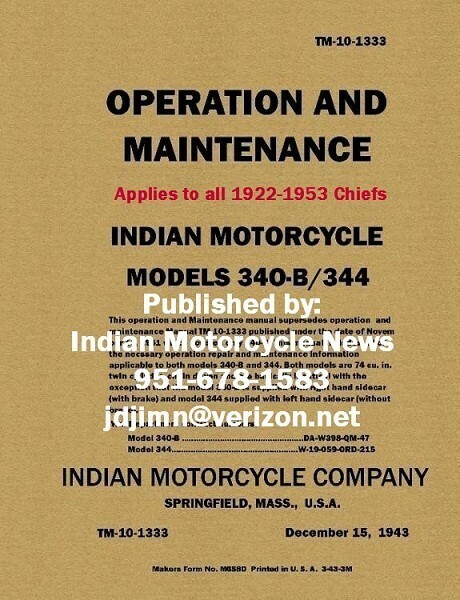 This is the first & most comprehensive Chief Overhaul Manual, the Indian factory ever produced. We recommend using this manual together with all, Per & Post WW II Chief manuals.